Having Problems Fitting Your Oculus Rift Over Your Glasses? Try This Simple 3D Printed Adapter! Sometimes it’s rough having glasses. They fall off, they fog up, they get scratched, and it’s ridiculous trying to wear sunglasses over them – not to mention a virtual reality headset. 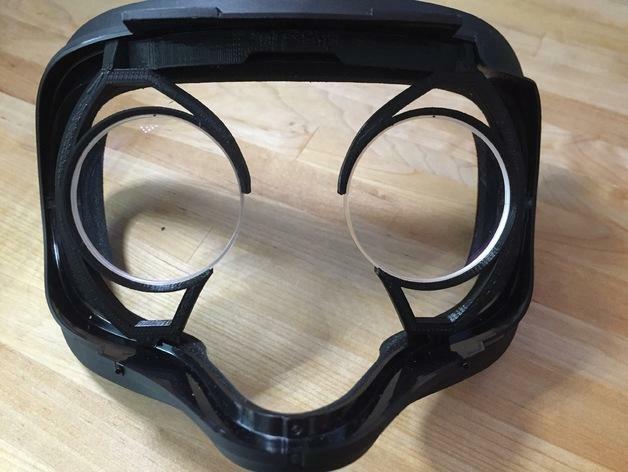 People have been really excited about the Oculus Rift for quite some time now, but a Thingiverse user named Joshua Egstad (aka jegstad) noticed that there was a bit of an issue when he received his: it didn’t fit so well over his glasses. “In practice, what I’ve found works best is to hold the headset in both hands, face down with the top strap towards you, and apply firm upwards pressure with both your thumbs at the same time against the plastic rim of the facial interface until the tab starts to pop out,” he said in a comment. Note: before you print the adapter, you should probably make sure you have a spare pair of glasses, as the design involves removing the original lenses from your glasses and slotting them into the 3D printed adapter. (Egstad suggests marking the lenses with a Sharpie or some other implement before removing them from the frames, so you know which way is up.) The adapter itself looks to be an easy, one-piece printing job, and when it’s finished, your lenses can be fit into a groove on the adapter’s inner rim. It should be a loose fit at first, says Egstad; it will tighten once the adapter is fitted onto the facial interface. Once the adapter, with lenses in place, is fitted to the facial interface, the whole assembly can be reattached to your Rift by pushing in a couple of tabs. Boom – perfect virtual vision. Is this something you might need? Discuss with us further over in the 3D Printed Oculus Rift Adapter forum at 3DPB.com.